Spinal cord is one of the most fragile and most prominent parts in our body; any damage to it can make us bedridden. The most chronic aliment that is often observed related to the spinal cord is Slip Disc or in simple words the rupturing of shock absorbers. Spine bones are said to be layered on one another and the discs are kind of beds or shock absorbers which are placed between the disc. Though the disc do not slip but they do split or rupture and this failure leads to the gel or fluid to run into the other tissues present in the arrangement of spine and disc and this is the main cause behind this ailment as fluid that is released creates pressure on the spinal cord or on the nerves causing pain in the damaged disc or the area which falls under the influence of the affected nerve. This ailment that does cause a lot of trouble can best be cured by a Connective Tissue Manipulation and Mackenzie Exercise Regime treatment that reduces the tension around the spine and changes the mechanism of the disc helping it return to the normal position and thus resolving the problem and reducing the ongoing pain. This ailment can best be treated with regular Physiotherapy treatment which helps in regaining the vitality of the discs that act like cushions. Slip disc is not just limited to the neck or spine, it can also occur in your back. Since there is a widespread network of nerves in our spine this can lead to the propagation of pain to the nearby areas as well. Some of the most common symptoms of ruptured disc are numbness, moderate to severe pain, tinkling or weakness in the neck, shoulder, arms and hands and the same sensation can be felt in the back legs and feet. 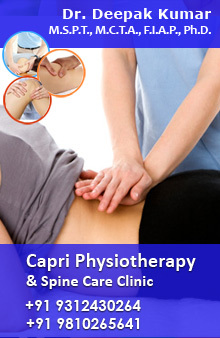 Delhi Physio being one of the leading providers of cost effective Physiotherapy Treatment and Services treat its patients in a comfortable environment that revitalize him of his ailment. Our teams of professional experts carefully listen to the patients and understand their problems, we then personally recognize their pain and by making use of our years of experience, we cure our patients in the best possible way.